Back for her fourth year at Act II Entertainment, Puerto Vallarta and New York City's favorite, Sutton Lee Seymour stars in 'Dragflix.' Catch her in The Red Room every Tuesday & Thursday at 9:30 pm through April 18. 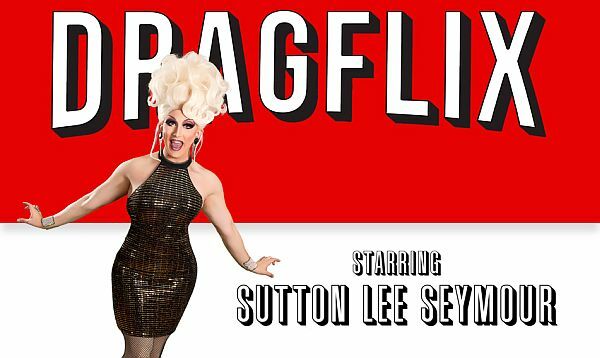 Puerto Vallarta, Mexico - Drag Star Extraordinaire, Sutton Lee Seymour, stars in "Dragflix," a non-stop comedy that spoofs favorite TV shows, movies, and musicals with parodies of The Handmaid's Tail, Game of Thrones, Harry Potter and more! Sutton Lee Seymour is New York City's Live-Singing Comedy Queen of Stage and Screen, having performed with Atlantis Events on gay cruises and resort vacations, along with making appearances on Bravo TV's Watch What Happens and Live with Andy Cohen! She's presented her shows to audiences across the US and in vacation towns like Ogunquit, Rehoboth, and Saugatuck! In New York City, Sutton Lee Seymour has become the premier "Broadway Queen," hosting and starring in a number of weekly shows and cabarets! Back for her fourth year at The Red Room at Act II Stages, this adorable Diva has created a non-stop and oh-so-fun evening of drag entertainment with her show, "Dragflix." The evening began with a fantastic video intro to the show followed by her delightful version of "Tear Me Down" from Hegwig & the Angry Inch. We also enjoyed her theme song, "Suddenly Seymour," from the musical Little Shop of Horrors. This amazing Queen then taught us a clever little song partially in Spanish) about the male anatomy. She moved on with an outstanding parody of The Handmaid's Tale that included a classic SNL video that was absolutely hysterical! In her fun and fast-moving depiction of this series, she brought us up-to-date on the storyline through song and theatrics. We enjoyed more musical numbers as she took aim at The Sound of Music featuring tunes like "The Lonely Goatherd" and "Climb Every Mountain" in an outrageously funny musical medley. We were then taken back to the '90s with a 3 minute non-stop, over-the-top, parody of the movie Titanic that had us roaring with laughter. Her version of, "My Heart Will Go On" from the movie was priceless! The Harry Potter segment of the show was especially satisfying because Sutton Lee Seymour is a huge fan, having seen all the movies, read all the books and attended the Broadway Play. In an action-packed few minutes, she put an amusing spin on this colorful tale. Taking a break from TV and movies, Sutton Lee Seymour went on to sing about the woos of gay dating as she parodied "Proud Mary" changing the lyrics to "Proud Fairy." What a riot! Returning to TV, she electrified the audience with The Game of Thrones, as she presented 7 seasons in 3 minutes of lightning fast plots. I especially loved Disney's Lion King segment, featuring the songs, "I Just Can't Wait to Be King" and "Circle of Life." She ended the evening with a spectacular medley from Chicago, starring as both Roxie & Velma, in a wonderfully hilarious tribute to the musical. This was a thrilling conclusion to the show! With thunderous applause, Sutton Lee Seymour was persuaded to return to the stage for an encore of her theme song, "Suddenly Seymour," much to everyone's delight. I've seen many drag shows in PV and each one offers a different style of entertaining. I found Sutton Lee Seymour very quick, sharp and theatrical. Her singing voice is one of the best I've ever heard in a drag show. Dragflix is a well-designed, top-notch show, delivered by a skilled and totally adorable, musical theatre professional. Seymour is outrageously funny, with a dramatic stage presence and a complete command of the production. I would also say that this show appeals to a wide audience. Yes, there were risqué lyrics and innuendo, but in my opinion, it did not go over the line for the mixed crowd of young, old, gay and straight. I loved "Dragflix" and think you will as well. Sutton Lee Seymour is beyond delicious as she sings, acts and communicates in a wonderfully engaging way. You'll leave the show a little in love with this gal! I know I did! 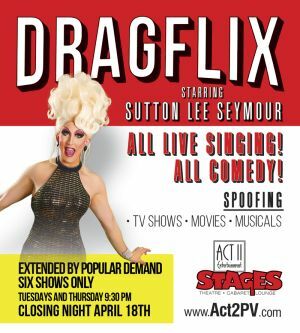 Dragflix can be seen in The Red Room at Act II Entertainment every Tuesday and Thursday at 9:30 pm until April 18th. Tickets to all shows can be purchased online at actiientertainment.com, or at the box office, which is open daily from 10:00 am to 10:00 pm.